When I see a butterfly in a summer field, it brings back a specific memory. The impressions are as vivid as they were 9 years ago when I witnessed something miraculous! My rare observation was not in warm weather, nor was it outside in a felid of flowers. What I witnessed took place on a frigid winter day in a large urban hospital room in the Intensive Care Unit. I lingered for hours at the bedside of our daughter, Heidi Melinda. She was in a medically induced coma following surgery to remove two cancers. She had ovarian and kidney cancer removed. But, after the surgery it looked like she was in serious trouble. She was on life support, not breathing on her own. Her lungs were failing. Heidi was motionless. Tubes sprouted out of her body, up to the ceiling or attached to machines on both sides of her bed. Watching over Heidi, I felt like I was living in a netherworld. I seemed to be viewing my daughter through a sheer gray curtain that no one could pass through. I felt helpless. I sat in a chair at the foot of her bed. My blurry eyes tried to focus on her. I realized suddenly that Heidi and I had two unexpected visitors. They did not come in through the door. I watched in silence as 2 enormous butterflies emerged from the atmosphere near her feet. I saw them distinctly, in every detail and in full color. I saw them closer than I ever saw a butterfly before this day. The brilliantly vibrant pair flew gently, gracefully, forward. They appeared to be playing with each other as butterflies do when you see them gliding and hovering around the dancing blossoms in a field on a summer day. These two butterflies were a deep red - crimson. Each one was the size of my hand. They were bright, velvety and large. In all my life, I have never seen a butterfly as large as this mysterious pair. I watched them and it was as though they danced together. Yet, the frolicking butterflies were the most normal scene I could ever experience. Spring sunshine brings us the beginning of flower gardens that will turn into a riot of vibrant colors we will enjoy until the end of the autumn season. Time passes though, and in our joy of the moment, we are unaware when the days begin growing shorter. Months and years pass. We barely notice the changes. The glorious dance of the butterflies, insects, and wild flowers gradually changes. There is a final time of blazing colors when everything intensifies. Autumn, we’ll recall, brought a different kind of landscape to our vision. It was a beauty, more intense than our summer days had been. Sometimes, a person will mention how they suddenly saw a butterfly that appeared unexpectedly after a loved one died. They appear without warning, and often they fly around a person. One friend told me how she experienced a head butting from a butterfly one day. It was as though the delicate insect was trying to get attention. It seems the butterfly is trying to communicate with a human. Butterflies arrive in pairs at times. I wonder if they are exceptionally bright and larger-than-life. Do they appear to be so otherworldly, like you could not possibly miss seeing them? In my experience, I knew for sure they were not of this world. Traditionally, it is believed butterflies are harbingers of renewal; transformation; healing; Since that day when I saw the butterflies, I began to use the motif in some of my art works. It’s an ancient symbol with deep roots as a metaphor in folk lore and the narrative accounts of antiquity. Inspiration and ideas flow or surround us as we seem to stand in an invisible, yet powerfully present, landscape. Many writers from a variety of cultural and religious backgrounds speak of the awareness of divinity they experience when they reflect on nature. Throughout Christian history, there has always been a theme of recognizing the work of God when we view nature. Then sings my soul, my Savior God to Thee; How great Thou art! People of all ages expressed thoughts about butterflies. The Mandarin Chinese word for butterfly means “seventy years.” Therefore, in their culture butterflies are a symbol of a long life. of maidens and marital bliss. Many Japanese families use the butterfly image in the family crest design. 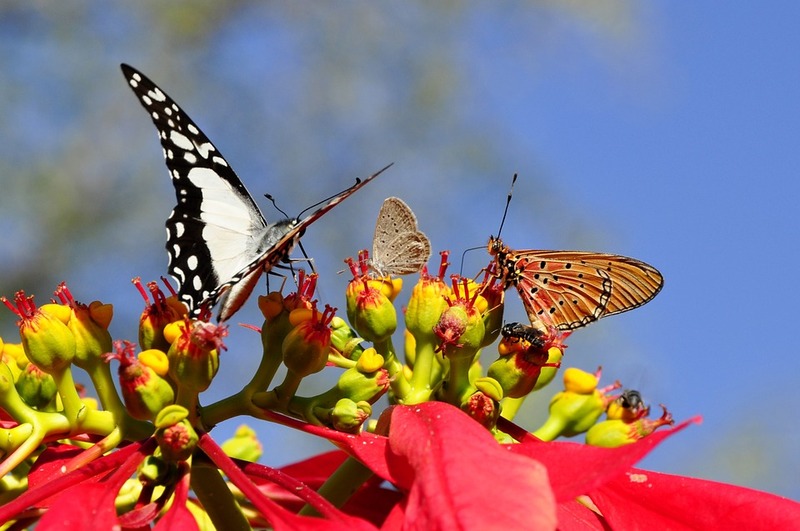 In literature we find numerous references to butterflies from ancient times to the present. Early Greek art features images of butterflies on vases. Butterflies are featured in their in mythological tales. It is recognition of the presence of a soul. We are more than a physical body, but we possess a soul that is invisible and eternal. We can read from the beginning of the Bible in genesis, that humans were created to live in a beautiful garden and to tend it. We were created to be friends with God; we were made to live forever with God. One important aspect of Christian faith is the hope of resurrection. The symbol of the butterfly is an important image to Christians. You will find this image used particularly at Easter when we think of the life cycle of the butterfly. We get the picture that signifies how Jesus was put to death and after three days, he arose. Every person who has accepted Jesus into his/her life is filled with the resurrection power of Christ. At Christian funerals and memorial services there will usually be references to a butterfly as an example of how we all will shed our body at death, and then we will come alive again with Christ. This is the message of resurrection power – because Christ died, we, too have been given the gift of eternal life when we accept Jesus into our own life. Let’s take a look at 1st Corinthians and we’ll find a marvelous promise. Don’t be surprised one day if you see a shimmering butterfly flying around you in an unusual way. It could be a time when you feel helpless or broken, like I did. It may happen at a time when you least expect a visitation or are thinking nobody cares about you. . Just smile! Heidi remains free of ovarian and kidney cancers.